Laurus nobilis, commonly known as “Sweet Bay”, “Bay Laurel” or just plain “Bay”, is a perennial herb with both a rich past and a boundless present. Mentioned in scripture, Sweet Bay, is the plant used by the ancient Greeks to crown victors and by the Romans to cushion the dead. Our modern English language is peppered with words and phrases stemming from the plant and its Greek legends; “Baccalaureate”, “resting on your laurels” and more. Not just the ancients’ love Sweet Bay, fast forward to the modern era and Sweet Bay is just as useful and plays a role in modern history. Besides being the 2009 “Herb of the Year”, an honor bestowed by the International Herb Association www.Iherb.org – it also plays a small role in my own history. Serves one – can easily be doubled or tripled to serve more. 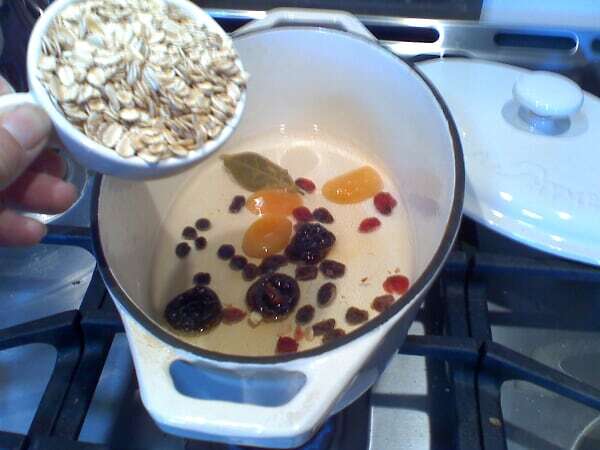 Bring the water, fruit, bay & salt to a boil in a small heavy sauce pan and add the oats. Reduce the heat and cook for 10 to 20 minutes (timing depends on desired consistency of your cereal) stirring occasionally. Cover, remove from heat and let stand a few minutes. Remove the bay leaf. Top with nuts, flax seeds, cinnamon, nutmeg & honey & serve. Posted in Summer Fest 2009. My niece R., just posted this on facebook…I have such good kids in my family tree…. "Yummm… I just made ur bay leaf oatmeal, and I added Peanut Butter!!! So tasty!!! THANKs for the recipie" …Well, my dear girl, you are welcome!